What is the first thing that comes to mind when you think about winter? Snow banks? Wind chill? Traffic jams? Shovelling the driveway? Slippery sidewalks? Winter can be a pain in more ways than one, sometimes quite literally when you slip and fall on an icy patch. But it can also be a lot of fun. Only in the winter you can skate, ski, snowshoe, go tobogganing, play hockey, build snow forts, make snow angles or have a snowball fight. It is easy to forget about all the fun aspects of winter when you are stuck in a snow storm or get half frozen while waiting for a bus. Luckily, there are a lot of places in Ontario, where you can enjoy winter and let your inner child out. We have teamed up with Expedia.ca to show you the top picks. Arrowhead is a winter fun central with every possible activity on offer. 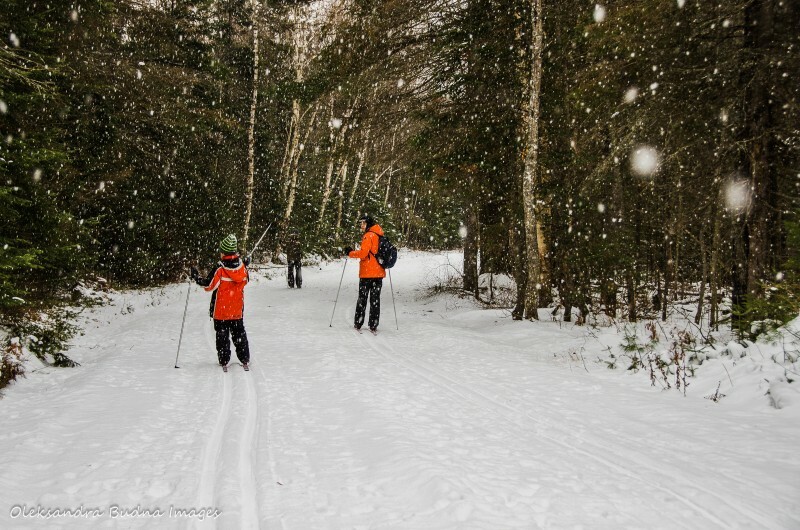 Imagine skiing through a snow covered forest on one of the park’s many trails (there are 33 kilometres of cross-country ski trails in total rated from beginner to advanced). 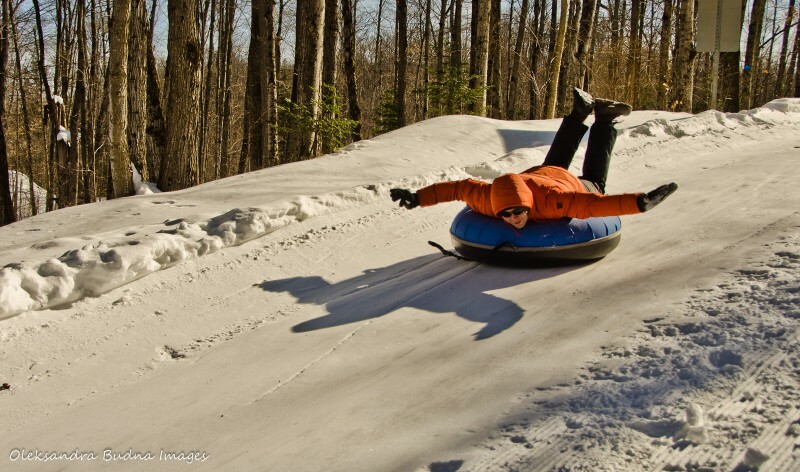 If skiing is not your thing, you can hike or snowshoe to the Stubbs Falls or slide down a tubing hill (tubes are available for free). And make sure to stay for a late night skate along a torch-lit skating trail. There are two warming huts in the park and open fire pits in several spots to take a break, have a snack and get warm. Skiing equipment, skates and snowshoes are available for rent at the park office. You can come for a day or stay overnight in one of the park’s camp cabins. Algonquin is best known for its fall colours and great canoeing but it has just as much to offer in the winter. With over 70 kilometres of cross-country ski trails, it can accommodate skiers from beginners to advanced. Snowshoeing is permitted anywhere in the park, except for the ski trails. For skating enthusiasts, a parking lot at the Mew Lake Campground is turned into a skating rink. 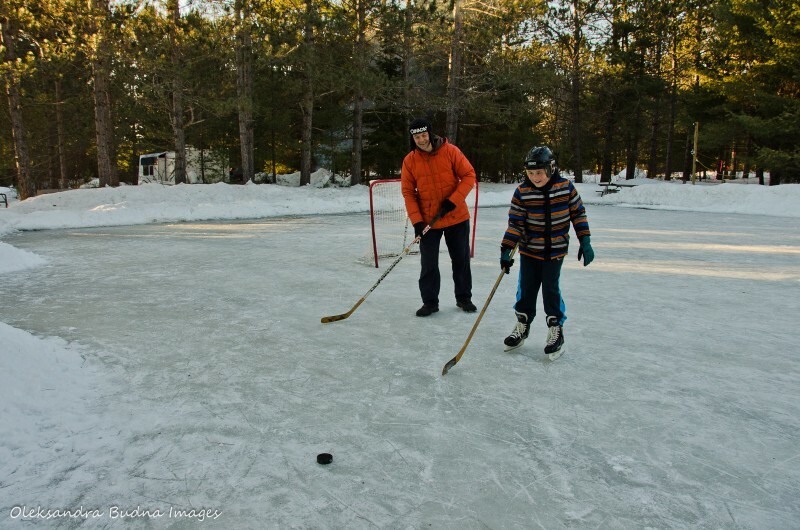 Hockey sticks and nets are available nearby should you feel like playing a game with your friends. And if you are looking for something unique, try dog-sledding offered by outfitters in the park. Day permits are available at both West and East Gates or at the self-serve station at the Mew Lake Campground. 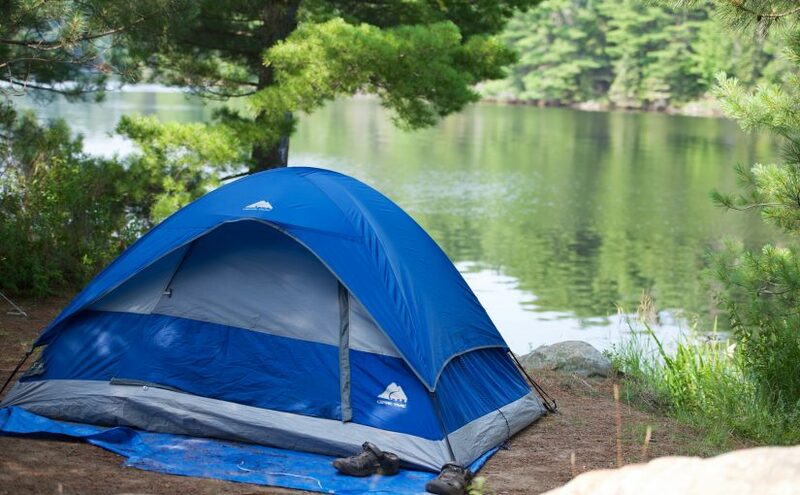 The Mew Lake Campground is open year round so you can stay in one of the seven comfy yurts (yurts need to be booked in advance) or at one of the electrical or non-electrical campsites, which are available on the first come, first serve basis. If you feel brave, you can also try backcountry camping. Gear and equipment rentals are available from Algonquin Outfitters located near the park’s west entrance. For many people, Pinery is associated with summer and the beach. The park, however, is open year round and offers a lot of fun activities in the winter. With 38 kilometres of cross-country ski trails, Pinery has one of the best skiing in Southwestern Ontario. There are also designated snowshoe trails, a skating rink and a toboggan hill. And, of course, the beach in the winter is a sight to behold. If you wish to spend more time in the park, you can bring your tent and stay at one of the campsites at the Riverside Campground. For those who find winter tenting too extreme, there are also 12 yurts, 2 soft-sided shelters and a camp cabin, all of which can be booked online. Cross-country skiing equipment and snowshoes are available for rent in the park. Killarney is among the most famous parks in Ontario and should definitely be experienced in all seasons. Hit one of the three cross-country ski trails (33 kilometres in total) or explore the park on snowshoes and see it in a new light, both literally and figuratively. There is a warm-up hut in the day-use area, a great place to take a break from you explorations and get warm by the wood stove. George Lake campground is open year round so you can stay overnight to get to know the park better. There are six yurts available and, more recently, a camp cabin. Since the park roads are not cleared in the winter, you will have to walk to your yurt from the park office (about 500 metres) but it is all part of the fun. 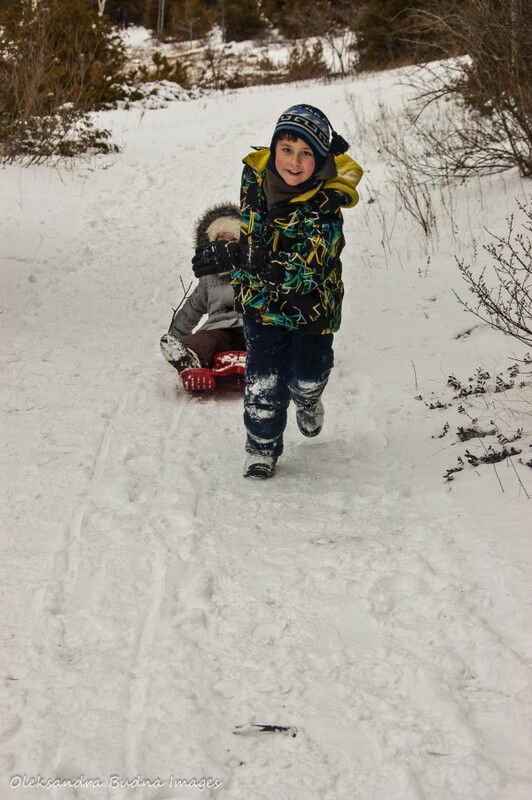 Sleds are available for transporting your gear and supplies but they don’t work very well for tobogganing. So make sure to bring your own. Snowshoes can be rented at the park office but you will have to bring your own skiing gear or rent it from your local outfitter or Mountain Equipment Co-op store. MacGregor Point is another great Ontario Park to visit in the winter. It has 11 kilometres of groomed ski trails as well as snowshoe trails located in the Nipissing Campground. You can also use unplowed park roads for both skiing and snowshoeing. The park’s most famous winter attraction is a 400-metre-long skating oval. Skating at night, when the oval is lit up and the whole forest is sparkling, is a magical experience. There are 16 yurts available for an overnight stay. A lot of people also bring their tents and trailers. There are no rentals available in the park so bring your own equipment. The winter solitude and beauty of Silent Lake is not to be missed. Over 40 kilometres of cross-country ski trails will satisfy both novice and experienced skiers. If you are into snowshoeing, Bonnie’s Pond Hiking Trail is converted into a snowshoe trail in the winter. Ice fishing is another winter activity you can try at Silent Lake. Make sure to consult the Ontario Recreational Fishing Regulations and the park office since Silent Lake has some exceptions regarding ice-fishing. Six yurts are available in the winter months starting mid-December. No gear rentals are offered in the park. Only thirty-minutes away from Toronto, Bronte Creek is rarely on our list of camping destinations. It is, however, a great park for a day visit, especially in the winter. An Olympic size skating rink is one of the park’s main attractions. Skate rentals are offered in the park. There are also ten kilometres of cross-country ski trails. And, of course, no winter outing would be complete without a toboggan hill. 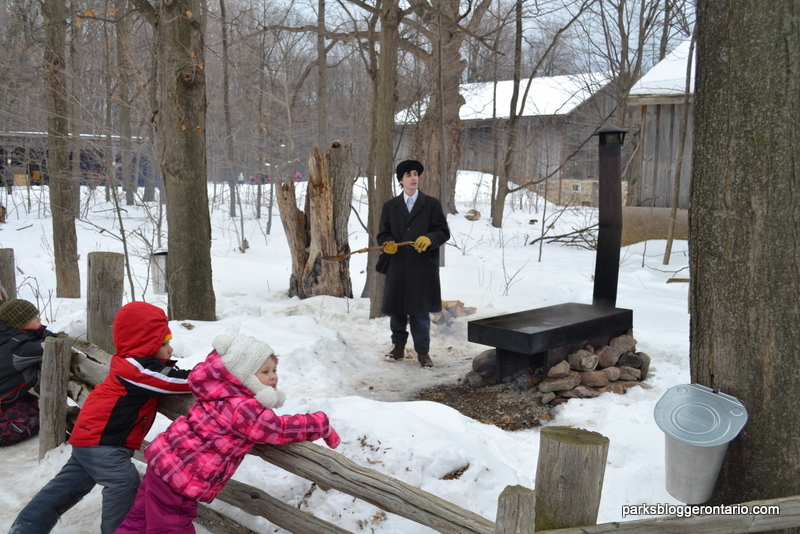 Bronte Creek offers lots of fun events in the winter. You can experience Victorian Christmas with traditional crafts, refreshments, songs and stories. Or come and celebrate New Year’s with a public coyote howl, hikes, music, bonfire and skating (skating rink is open until 9:30 p.m. on December 31). What does Wasaga Beach mean to you? Sandy beach? Inviting waters of Georgian Bay? Summer crowds? 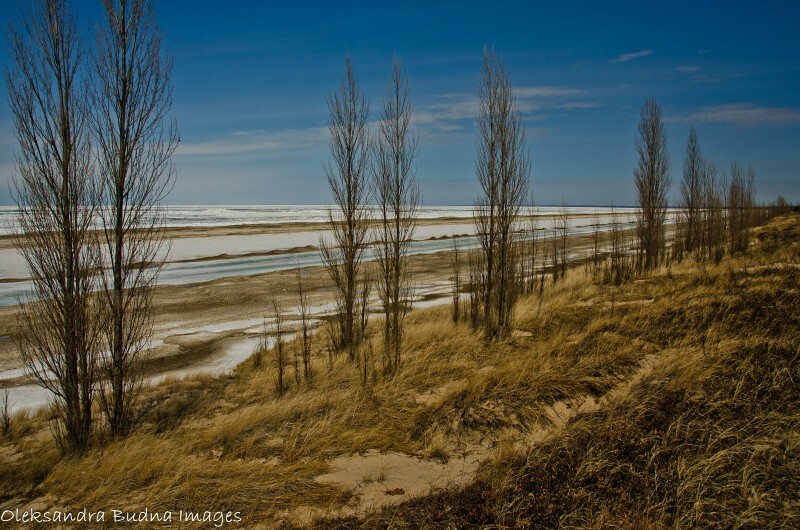 Winter is a great time to experience a different side of Wasaga Beach. With over 30 kilometres of groomed ski trails, it offers some of the best Nordic skiing in Central Ontario. For snowshoeing enthusiasts, the park has a 10-kilometre snowshoe trail. Wasaga Ski Centre offers snowshoe and ski rentals as well as refreshments. There are also warm-up shelters available along the trails. Wye March Conservation Area located in Midland is a great place for a winter outing. With over 25 kilometres of well-kept cross-country ski trails, the place is perfect for all skiers from novice to advanced. Snowshoe trails are also available in the park, and you can rent ski equipment and snowshoes at the interpretive centre. On top of that, Wye Marsh organizes special “Full Moon Snowshoe/Ski Nights” when the trails are open from 6 to 9 p.m.
First and foremost, of course, Wye Marsh is home to a great variety of wildlife, especially birds. Stop by the interpretive centre to learn more about this important habitat. 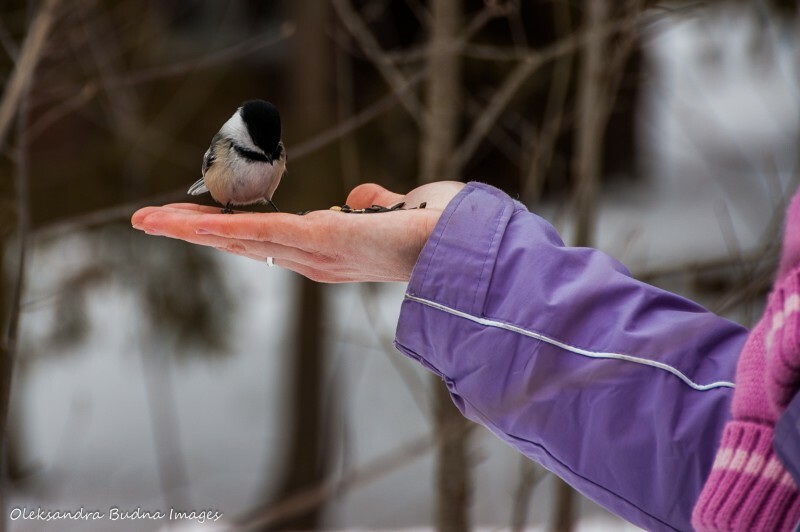 Kids will enjoy hand-feeding chickadees. And make sure to visit the trumpeter swans and learn about their restoration success story. Located in a UNESCO Biosphere Reserve at the highest point of the Niagara Escarpment, this beautiful area has it all: 27 kilometres of professionally groomed cross-country ski trails, 10 kilometres of snowshoeing trails, spectacular views, and the longest suspension bridge in Southern Ontario. There is also a warm-up chalet, a snack bar, change rooms, a ski waxing hut as well as cross-country ski and snowshoe equipment rentals. So dress warmly and get outside! Which new activity do you want to try this winter? This is a great post! So much information. I love it and needed to know these things! You mention people bring trailers and tents to McGregor, Is there tent camping there also then? I am looking to winter camp in a tent this winter and it sounds like an awesome place to go! Thanks s much for the help! Yes, you can camp in a tent at MacGregor Point. Birch Boulevard Campground is open for reservations in the winter. There are 49 sites. 15 of the sites are yurts, the rest are just regular electric campsites. Most of the sites had trailers but we saw a few tents as well. Hope it helps.